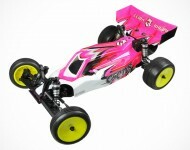 3Racing introduce the Cactus 2WD racing buggy kit. 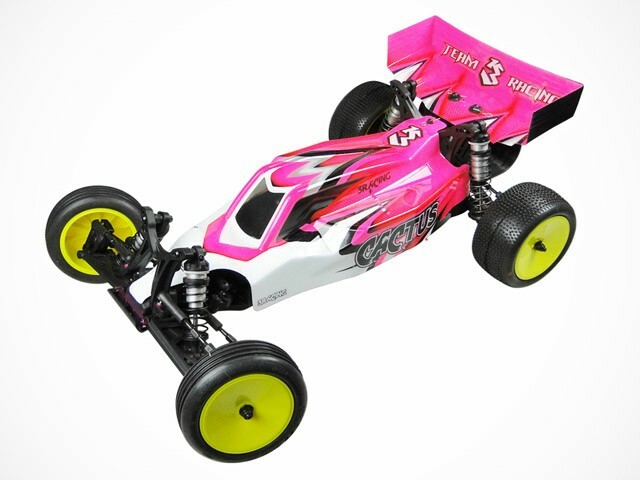 Developed from the ground up over the course of 18 month the buggy is based on a long wheelbase composite chassis that sports wire routing tunnels and a battery mount for both straight and shorty LiPo battery packs. The front end of the buggy is made from a lightweight composite plastic construction with aluminium pivot pin brace and multiple mounting points for the camber rods and shocks while the rear end houses the convertible gear box. The buggy can be build as 3-gear rear motor or 4-gear mid motor variant straight out of the box, it comes with a heavy-duty slipper clutch and widely adjustable suspension parts to alter rear toe-in and anti-squat setting. Included in the kit are also 12.5mm big bore aluminium shock absorbers, 12mm wheel hex adapters, a carbon fibre ESC mounting plate and a cab forward body shell along a large rear wing.